This is a 1 Year Subscription online course. After you place your order, we will email you an Authorization Code and you can start using this online course immediately. Students can also take an interactive journey into the miracle of pregnancy and childbirth with the 9 Month Miracle, as Adam and Eve join medical experts for a month-by-month guided tour inside the body and body systems as their baby develops. Dissectible Anatomy - Bring the human body to life for your students with 4,000 body structures in our fully dissectible bodies - complete with audio pronunciations. The Inside Story - Structure and function of the major body systems come to life with engaging content and animations covering the twelve body systems. 3D Anatomy - Eight new fully-rotating 3D anatomical images included to help your students identify and visualize important structures then take an animated tour through each designated body part. 9 Month Miracle - Teach your students about the miracle of conception, childbirth and every stage in between with a fascinating visual journey. Bonus feature includes dramatic in-body photography by world renowned photographer Lennart Nilsson shows the developing baby month by month. Health and Wellness - Nutrition and physical activity lessons included will provide your students with a self directed learning path, complete with animations and interactive resources. The engaging content and humorous dialogue cover an introduction to proper nutrition, a comprehensive review of the Food Pyramid, how to read food labels, and how to make wise food selection choices. Over an hour of narrated content, animations and interactive quizzes teach, reinforce, and help assess student comprehension. Smoking and Tobacco Use - Teach your students about the short and long term harmful effects of smoking cigarettes, other tobacco use and second hand smoke has on their bodies as they follow along in this chapter, complete with narrations and animations. Alcohol and Drug Use - Teach your students about the dangers and negative effects of alcohol and drug use has on their bodies. Misuse of over the counter medications, abuse of prescription drugs, illegal drugs, and how to cope with peer pressure are covered as students follow along in this chapter, completed with narrations and animations. Supplemental Resources - Reinforce your students comprehension with audio pronunciations, glossary of anatomical terms, system reference text, and interactive anatomy puzzles. Self Assessment -allow your students to test, reinforce, and help assess their comprehension with 14 all new multi question quizzes. 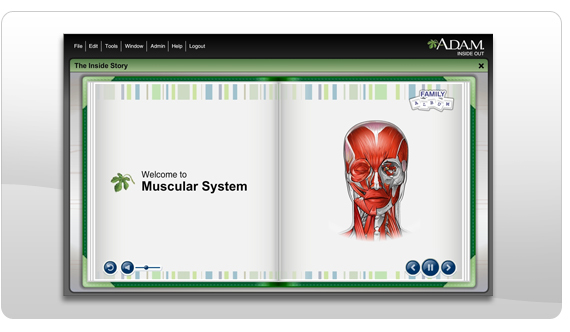 Curriculum Resources -Valuable reference text includes information on each of the body systems to assist instructors building their curriculum and help students learn more about a particular topic of study. Print capabilities and supplemental detailed bank of images available to create student worksheets, handouts, quizzes, and tests.